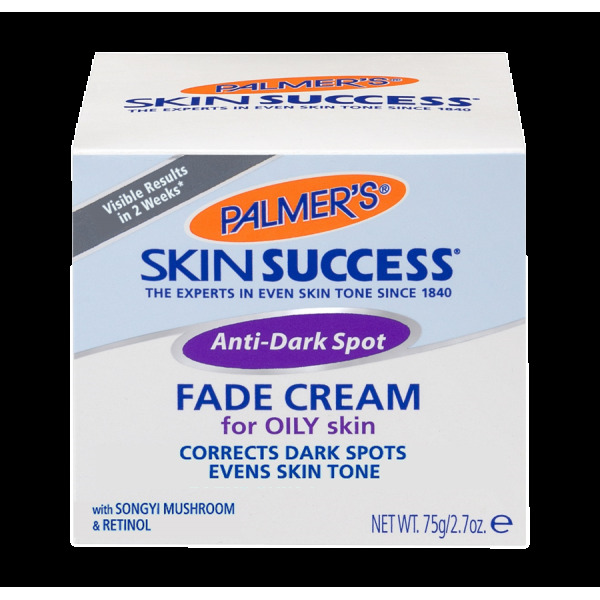 Infused with natural skin brighteners Vitamin C, Japanese Songyi Mushroom Extract and anti-aging powerhouse Retinol, Palmer's® Skin Success® Anti-Dark Spot Fade Cream Oily Skin enhances skin's radience and helps minimize the apperance of fine lines and wrinkles. Specifically formulated for oily skin types to control shine and leave a matte finish. A tone correcting fade cream that effectively lightens the appearance of dark spots and discoloration, leaving skin more luminous and evenly-toned. Uniquely formulated to leave a matte finish and control shininess for skin types prone to oiliness. Formulated with a powerful pigment-perfecting blend of ingredients: 5% Niacinamide, Retinol, Songyi Mushroom, Vitamin C, and Vitamin E.
Contains an added sunscreen to prevent dark spots from recurring. 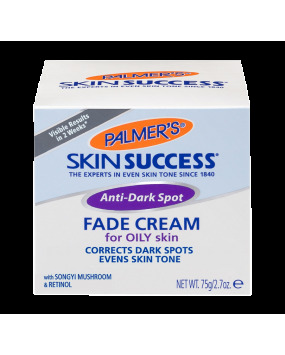 Apply Palmer's® Skin Success® Anti-Dark Spot Fade Cream Oily Skin to afftected areas twice daily on clean, dry skin. Niacinamide - Corrects dark spots and discoloration. Retinol - Helps improve fine lines and boosts collagen. Vitamin E - Provides antioxidant protection from free radical damage.